Unless your tipping style is straight-up Mr. Pink, you’ve probably spent precious hours of your life calculating, justifying, and arguing over The Right Tip. So many calls to make! First, if you’re on a date with a partner, you should be able to have a reasonable conversation about what’s appropriate that doesn’t end in one of you moving your stuff out when you get home. Avoid this under-the-wire guessing by talking about what went wrong, and if the server is truly to blame. Were they mean or just busy? In the latter situation, cut them some slack. Imagine the pure torture of your fellow server calling in hungover at the last minute and having to take on all their tables during rush hour. If the server is a jerk for no discernable reason, I like to start at 20% and deduct a dollar for every perceived infraction. But if this method lands you in the 10-15% zone, you should probably just talk to a manager. That way, you’re making it clear that you’re not being cheap — just real. You didn’t lose any life karma points here, so you can relax a little. But it’s also important to take responsibility when applicable: if you ordered medium rare but received a live cow on your plate, it’s on you to speak up. Your server can’t fix what they don’t know is wrong. 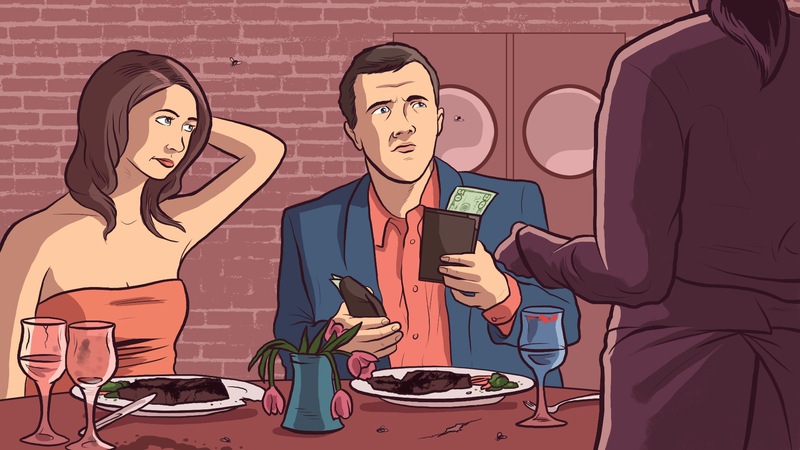 If you’re on a first or second date, you need to handle the situation with some tact so you don’t tense up at the last minute or look like a jerk — especially if you like this person, and especially if they’ve worked in the service industry. If the latter is true, defer to their expertise — even if you’d rather leave a mean note on the receipt with whatever change you have in your pocket. If your date has no guidance on the subject, leave something low but not embarrassing (17—18%). You don’t want to look petty and cheap when you’re just getting to know someone. Plus, making your date watch you dress down a waiter will only put more pressure on you. That thing about judging someone by how they treat a server is something people actually do, and you’ll look like the bigger person if you let it slide this once. There’s nothing more taxing than running late because your cabbie is taking the scenic route. Remain calm though — you’re in the right. If a driver eschews both your own advice and the guidance of GPS, don’t stress out about deducting whatever money the driver racked up. However, don’t look for offense where there is none — a driver hitting unexpected traffic or missing a turn is not the same thing as actively ignoring you when you try to tell them they’re going the wrong way. Either way, try not to stress out about it; unless you’re on a mini road trip to the airport, 20% of a cab ride isn’t going to be that huge of a tip. Congratulations on making it to the point in your life where you split the bill evenly instead of channeling your inner mathlete every time dinner ends. Still, splitting the bill can come with some anxiety-provoking injustices — like when your friend ordered three cocktails while you were sucking down tap water all night. Sure, your entrée cost $5 more, and you did insist on that appetiz— ugh. Imagine the diseases you could’ve cured by now if this wasn’t how you spent your brain space. Relax. Unless you’re out to dinner with a sociopath, the disparity will come up when the check comes. Instead of stressing out throughout dinner, use this time to let your friend know they can just leave the tip. You should also let them know what that tip is — I’ve seen “forgetful” people tip on just their food instead of the total. Take a deep breath and be bold to make sure this doesn’t happen — your name is on that receipt! This is your reputation we’re talking about here. If you’re the overeater, avoid unnecessary (and awkward) math, and just offer to leave the tip before it even comes up. A) You’re probably saving some money anyway and B) There will come a time when you’re The One Who Ate Less. Pay it forward, don’t stress out, and be glad you’re no longer of the age where dessert is a course reserved for nervously arguing over three dollars. If you’re from North America, this one’s so much fun! Mostly because every other country pays their servers livable wages and any tip is just a kind of thumbs up. Instead of waiting to worry when it’s last call and time to settle up, do some research on the country you’re going to (or see this helpful guide). You can also ask friends who have spent time in the country for more nuanced advice. As a general rule of thumb: aside from America and Canada, a 10% tip is generous and 15% is baller. A lot of our most esteemed apps ask that you take a leap of faith and tip before you even receive anything, which is convenient much of the time but anxiety-provoking when your Seamless order is 30 minutes late. Last-minute hunger-induced complaints will only make you more tense. Instead, if you’ve been the victim of bad service you already paid for, get on the phone and complain or leave a crappy review later that day. On the other hand, if the service is above and beyond — your laundry delivery driver carries your 40 pound bag to your fourth-floor apartment, for example — feel free to give them an additional single or two. What the app doesn’t know won’t hurt it. Premiering September 29: The new video series YOU GOT THIS! presented by Adequate Man in partnership with Gillette Clear Gel. Tune in here! This post is a sponsored collaboration between Gillette Clear Gel and Studio@Gawker. Stephanie Georgopulos is the author of the Kindle Single, Some Things I Did for Money.